Posted April 17, 2019 at 9:14 am . 3 comments. 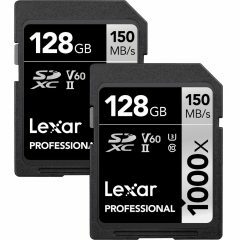 Adorama is discounting 2-packs of Lexar UHS-II SDXC high-speed cards, rated up to 150 MB/s. These are significant savings and the lowest prices we’ve seen yet. A 128GB 2-pack is $75.99 and a 64GB 2-pack is $41.99. $54 on B&H still active. HOT!